Where are you David? You have transmitted to posterity the image of Lepelletier dying for the fatherland : there is one more picture left for you to create. David: Indeed I will create it. [Où es-tu David ? tu as transmis à la postérité l'image de Lepelletier mourant pour la patrie; il te reste encore un tableau à faire. Three months later to the day, on 14th October 1793, David announced the completion of his painting and asked for permission to remove the Lepelletier temporarily from the Convention. 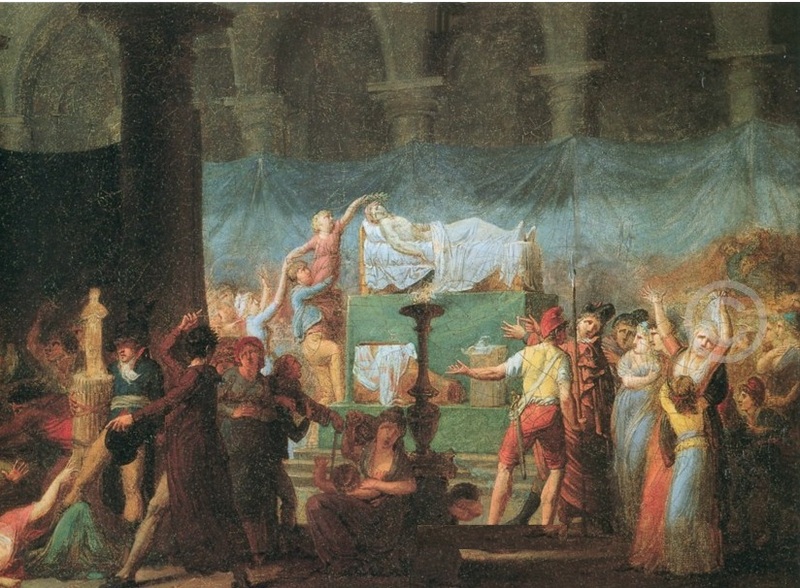 On 16th October, the morning of Marie-Antoinette's execution, the canvasses were exhibited in the courtyard of the Louvre as the centrepieces of a ceremony organised by the Section du Muséum in honour of the "two martyrs of liberty". They were then placed on display to the public in David's workshop. 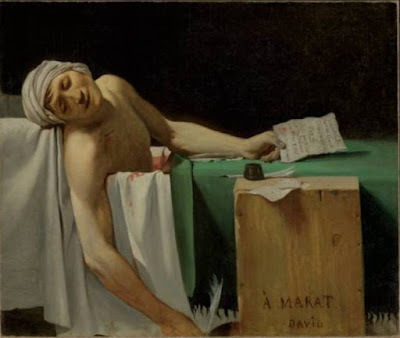 On 14th November, in a long and emotional oration, which was later printed, David formally presented his painting to the Convention and called for Marat to be voted the honours of the Pantheon. He proclaimed that he had taken up his brush to "avenge our friend, avenge Marat" and to ensure that his "livid and bloody features" would recall his virtues to posterity. The Assembly asked for the two paintings to be hung in the Salle des Séances on either side of the presidential chair (which David himself eventually occupied briefly in January 1794): the Lepelletier on the left next to a tablet with the Constitution of 1793; the Marat on the right next to the Declaration of the Rights of Man and the Citizen. On 8th February 1795 the picture was taken down from walls of the Convention and returned to David. During his exile it remained hidden in France in the safekeeping of Antoine Gros. On David's death it was included in the inventory of his possessions, dated 3rd March 1826, but not sold. In the second sale of David's effects (1st March 1835) it was bought jointly for 4500 fr by his daughter the Baroness Meunier and the widow of his son Eugène David. In 1886 it was presented to Belgium by the artist's grandson Jules David and now hangs in the Musées Royaux des Beaux-Arts, Brussels. There are four known official copies of the painting made by David's workshop. The two now in the Louvre and at Versailles were in David's studio along with the original at the time of his death. The Versailles version is of particularly high quality. The two are often identified as replicas made for transfer to tapestry as requested by workers at the Gobelins factory in May 1794. All four are reproduced in the French Wikipedia article Mort de Marat https://fr.wikipedia.org/wiki/La_Mort_de_Marat. 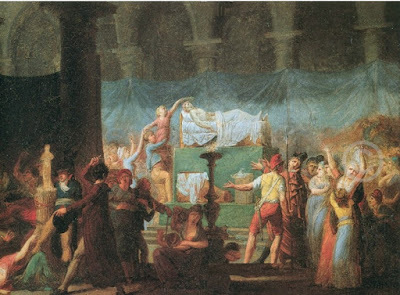 Some evidence for the genesis of David's composition is provided by his arrangements for the public display of Marat's body in the church of the Cordeliers . 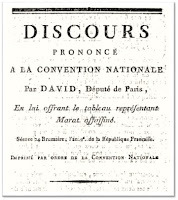 In the session of the 15th July on the proposition of Chabot, the members of the Convention decreed that they would attend Marat's funeral as a body. David, Maure and Bentabolle were officially named as commissaires for the exposition and funeral. By chance, David had been one of the last people to see Marat. On the 12th July he had been one of a delegation sent by the Jacobin Club to Marat's lodgings in the rue des Cordeliers to inquire after his health. Maure later reported: "We found him in the bath: a table, an inkwell, newspapers all around him, occupying himself ceaselessly in the public cause." 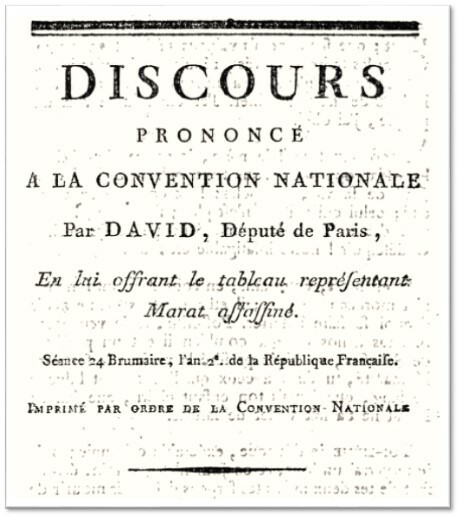 (Journal des Débats des Jacobins, 16 juillet 1793). I found him in a striking position. He had by him a block of wood, on which he had placed paper and ink, and with his right hand out of the bath, he was writing his latest thoughts for the safety of the People. Yesterday the surgeon who had embalmed the body asked how we intended to display it to the people in the church of the Cordeliers..... I thought that it would be interesting to show him in the attitude that I found him, writing for the happiness of the People. (Session of 15 July). On the 16th, however, he reported that he and his colleagues had visited the Théâtre-Français Section and come to the conclusion that the rapid decomposition of Marat's body made this plan impracticable. The funeral was brought forward to that evening and the corpse simply displayed on a dais under a wet sheet, with various props - the bath, bloody shirt and inkstand - to the side. Attributed to Fougeat, Funeral of Marat, oil. 59cm x 73cm. They took a porphyry bath from the rooms of the Louvre, covered it with a tricolour flag and placed inside the body of Marat; he was visible under the material which was lifted to one side like a curtain. His right arm emerged with the hand holding a steel pen. People made the pilgrimage to kiss the dead hand and the allegorical pen which they believed belonged to the Ami du peuple. As a result some sort of dislocation occurred: the whole apparatus of arm and wires fell apart, and it could clearly be seen that the limb had come from a completely different corpse and did not belong to Marat at all. The journals of Paris did not dare to say anything. Souvenirs de la Marquise de Créquy, vol.8. p.122-3, quoted in Charlotte Corday et la mort de Marat, documents inedits (1909). onto a brown background. 27cm x 21 cm. Versailles Collections. This highly finished drawing was in David's studio at the time of his death and was included in the sale of 17th April 1826. It formerly belonged to Jules David, the grand-nephew of the painter and was given to Versailles in 1893. The assumption is that it represents an early stage in David's composition process. According to the catalogue for the Royal Academy "Citizens and Kings" exhibition, it was probably painted the day after Marat's funeral; like the finished picture, it emphasises Marat's almond-shaped eyes and swollen eyelids. The drawing was the subject of a widely-distributed engraving by Jacques-Louis Copia, "Marat as he was at the moment of his death". announced in the Journal de Paris, 24 ventôse an II (14th March 1794): "Portrait of J.P. Marat, l'Ami du Peuple, drawn from nature by David and engraved by Copola". The image closely resembles existent death masks of Marat. For David's possession of such a mask, we have only the intriguing footnote from Delécluze's Souvenirs which states that David had a death mask made "for his picture", that it was copied in plaster and sold "with the mask of Robespierre and others". In 1835 the police forbade public exhibition of these pieces. The claim is widely accepted that Curtius or Madame Tussaud made the mould for David. David, Drawing of Death of Marat, 1793. Pen, ink and white chalk on paper. This intriguing picture is part of the Bridgeman Art Library and can be found reproduced in a number of sites on the internet. Although it is in the Musée Lambinet and said to be by David himself, I can find no reference to it in any of the secondary literature. The Bridgeman site has a video where the drawing blends seamlessly into shots of the original, but unfortunately there appears to be no sound (see below). There is no particular reason to identify this as a preliminary sketch rather than a copy, but some clue as to provenance would be appreciated. Sotheby's "Old Master Drawings" London 4th July 2007. The drawing was at one time considered to be a preliminary study for the Brussels painting, but is now generally considered to be of insufficiently high quality. Rosenberg and Prat in their catalogue raisonné of David's drawings identified it as a ricordo, a record of the finished work. They suggested that it was probably drawn for Madame Mongez or another of David's friends/pupils and dated from 1817-20 when the original painting had been hidden. In September 2008 the commercial Galerie Turquin in Paris excited a great deal of interest in the art world by exhibiting three paintings by David, a Paris and Helen, a portrait of Edmond Dubois de Crancé, and thirdly a version of the Marat, which is now generally accepted as a preliminary study. The picture is seven-tenths the size of the original (though it lacks the extensive empty vertical space above the figure) It was diiscovered by the expert Hubert Duchemin when it came up for auction and has been the subject of extensive restoration and comparative study. According to the catalogue by Hubert Duchemin, the case for identifying the picture as a preparatory study rests on two main arguments. Firstly, the head of Marat looks like that of a cadaver. Especially when turned to vertical the mouth and entire face look slightly sunken. This detail resembles the original features revealed by x-ray analysis of the finished painting and thus strongly suggests an earlier phase of composition. Secondly there are a few repentirs, slight alterations in the wrinkle of the sheet and the height of the left arm. These whilst minor, would not have been present in a copy. Duchemin's thesis clearly lends weight to the idea of David's progressive idealisation of his subject: according to publication of the Galerie Turquin, "Our painting, stripped of the coldness and didactic concerns of a grand commission, demonstrates David's profound emotion when confronted by the remains of his friend." Citizens and Kings: Portraits in the Age of Revolution 1760-1830, exhibition catalogue, London: Royal Academy, 2006, cat. no. 148, pp. 311-2. Guillaume Mazeau, Corday contre Marat: deux siècles d'images pdf. 2009.